Posted on November 14, 2018 by gayle. 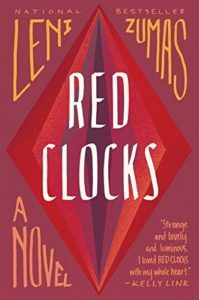 This entry was posted in Audiobooks, Fiction and tagged abortion, dystopia, feminine dystopia, leni zumas, red clocks. Bookmark the permalink. I was conflicted about this book. I agree about the importance of the subject (and how much closer to reality it is now than any time since the 1950s), but I found enough of the characters to be unlikable that I couldn’t relate to their situation. Unlikable is not the right word, maybe unrealistic? Whatever the word, the women did not resonant with me. Along those lines, I just re-read The Handmaid’s Tale because I couldn’t even remember exactly what it was about and wow. I had the same reaction as I did to Red Clocks and Vox. Scary times. Totally agree – I couldn’t relate to any of these women.